PTS100 primary liver cancer - Products - Gongwin Biopharm Co., Ltd. The WHO GLOBOCAN 2018 database shows the incidence and mortality rate of liver cancer rank top five among all types of cancer and more than 70% liver cancer patients are in Asia. The estimated 2018 global new cases and deaths of liver cancer are ~610,000 and ~560,000 respectively. According to 2014 World Cancer Report1, greater than 50% of the world’s new cases occur in Asia countries. Further, based on the statistics provided by American Cancer Society, China alone contributes more than half of the world’s newly diagnosed liver cancer which indicates the huge market potential of drugs for liver cancer2. The Market Data Forecast also estimates the CAGR of therapeutic market for liver cancer from 2017 to 2022 is 9.1%. Given that the symptoms are not obvious at the early stage of liver cancer, more than 50% of patients are first diagnosed at mid- to late-stage and are not suitable for surgery, liver transplantation or chemotherapy. For early-stage patients (30% of all liver cancer patients), the primary treatment option will be surgery, live transplantation, loco-regional ablation. For mid-stage patients (20% of all liver cancer patients), the standard treatment option is Trans-Arterial Chemo Embolization (TACE). Other options include Trans-Arterial Radioactive Embolization (TARE), Hepatic Arterial Infusion Chemotherapy (HAIC), and etc. 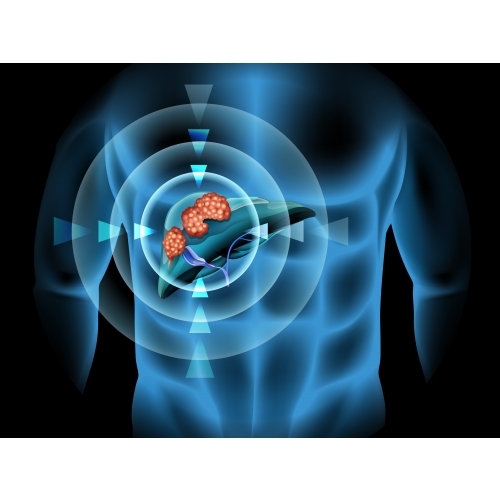 As for late-stage patients (50% of all liver cancer patients), targeted therapy and supportive therapy are the preferred treatment options. It is difficult to cure mid- to late-stage liver cancer patients. At this stage, systematic therapy like chemotherapy is often needed. However, the non-responsive rate to chemotherapy and the recurrence rate are relatively high. In addition, most patients will be suffering from the side effects caused by chemotherapy. As of now, there is no recommended effective therapy for those late-stage patients owing to not being suitable for TACE or TACE treatment failure. Given that the progression of liver cancer can be accelerated to late-stage within one year, there are medical needs for an effective and safe treatment option to slow down the disease progression. PTS is a novel small molecule tumor ablation agent aiming for loco-regional tumors via intratumoral injection, which will necrotize the tumor cells. Under ultrasonic guidance, clinical physicians can precisely intratumorally inject PTS to liver tumors. This way of administration minimizes the damage to normal liver cells with systematic therapy. According to our exploratory clinical studies conducted in China, one case shows there has been no recurrence for four years after eight PTS intrtumoral injections. The clinical results show that the liver tumors have been either completely or partially necrotized among 70% of the 83 enrolled mid- to late-stage patients. In 2018, the company has been granted a Phase II, dose randomized, open-label clinical trial in Taiwan. The goal is to evaluate the safety and efficacy of PTS treating inoperable liver cancer patients or patients not suitable for currently available loco-regional ablation therapies. This Phase II trial is actively recruiting in National Taiwan University Hospital. 4. He et al., World J Gastroenterol. 2012 Dec 14; 18(46): 6861–6864.